Heading over to T-Mobile’s support section, it’s clear that customers have been eager to know the carrier’s plans for the Sony Xperia Z1s for some time. Thankfully, the wait is over and Android 4.4.4 has finally arrived for the T-Mo exclusive device. A reader got in touch with us this morning with news of the update, claiming they were able to install it OTA. So if you have a Sony Xperia Z1s, go in to your settings menu and check for software updates and you should see that it’s available to download. If that doesn’t work, you can also install it using Sony’s PC Companion software. To update, you must be using stock software, so rooted phones will not be able to update from what we’ve heard. Let us know if your experience is the same as our readers, and if you manage to get it installed. 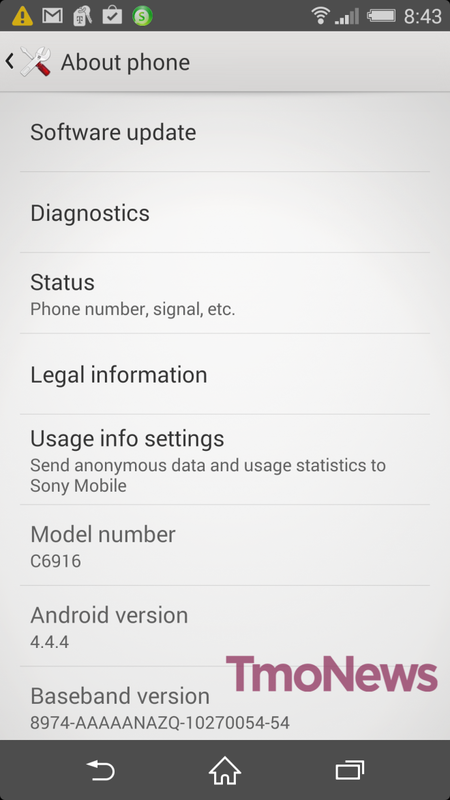 Full screenshot below shows the About section on the updated phone, clearly showing Android version 4.4.4 and Z1s model number C6916. Quit your bitching at least you can update your phone for those who have the original Sony Xperia Z are still left in the dark. Yeah, You HAVE to use the Sony PC Companion to do the update. It’s strange. oh I agree, I’m glad for the update. Xperia Z2 owners had to install their latest update via PC Companion, too. does this fix the google play services battery life issue, i wonder.. FINALLY!!! What a great way to start my day. Where is the HTC One M8 update? We are still on 4.4.2 and 4.4.4 is available. Why is this older phone first on T-Mobile? T-Mobile received technical approval to release to public for the HTC One M8 last Friday. They have to test T-Mobile specific software on it I’m sure. Like WiFi Calling and VoLTE. HTC’s Mo Versi confirmed that the company received technical approval from T-Mobile on Friday. What this means is that the update should be rolling out at some point in the near future, perhaps today, though Versi does not outline a specific date for HTC One M8 users on T-Mobile. 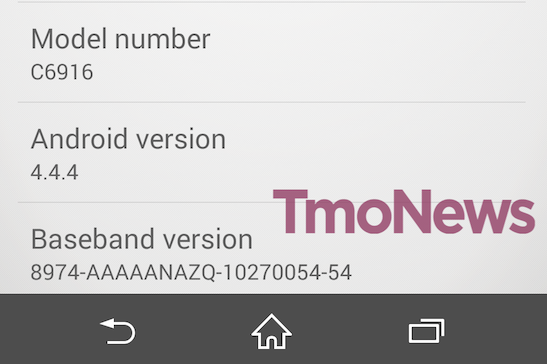 HTC M8 on T-Mo still using 4.4.2…. There’s really nothing in 4.4.3 and 4.4.4 other than OpenSSL fixes (natively) etc. These vulnerabilities by the way were also patched or blocked by Google Play Services for non 4.4.3 and 4.4.4 devices. So I don’t know what’s everyone’s rush to get to 4.4.3 and 4.4.4 except a version number bump. Might as well wait for 4.5 or 5.0 whatever they number Android L.
Z1s was on 4.3 not 4.4.3. It’s actually a sizeable update. The owners of Samsung note 2 are also still in the dark. It has been over six months and no further word from Samsung or T-mobile. Yep just updated mine. Wonder what the new features are other than the standard ones. Rooted phones seem to update fine. Happy they finally got the update out for us Z1s owners. I was starting to think we weren’t gonna see kit kat. Sony says they haven’t released the update. I think it was released early or something. Because it’s not available anymore. Thank you for that. I’ll keep checking. Have to find the battery display in the settings. It is there, just have to do some looking. As for the screen, same thing. I received the update and all is good.